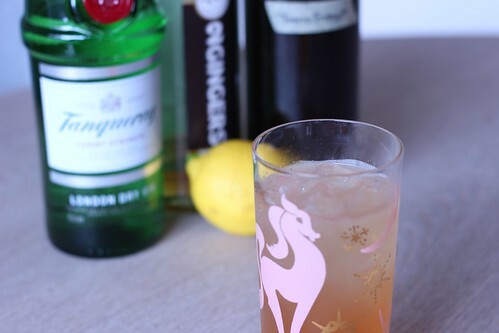 Now that we’ve navigated the fuzzy world of Gin Fix and Gin Fizz, the Gin Sling gives us something with more than subtle distinctions. That said the name history for the sling is its own murky space, pulling in the Toddy and a general discussion on what defines a cocktail. I’m going to let you just go read Savoy Stomp’s research on this one. You will note that the Lommebogen recipe is quite different in that it has whisky in there, along with lemon juice. Other sling recipes also have other ingredients like juice(s) and liqueurs, though I’ve not seen one with whisky and tonic in it, so I’m thinking that generally the sling name was fuzzy enough that it ended up being a bit of a crap shoot for what you’d get in any given bar. I used Irish Whiskey in this and I should also note that I’m using homemade tonic, which is why I have that nice pink color. Served in a tall glass. As noted Lommebogen has a very different recipe than the “standard” recipe, but it is pretty tasty. The whisky plays nicely with the tonic, which is something I’d not done before, and it definitely gave me some ideas to play with there. In a sense the classic Savoy/Café Royal recipe is kind of the like the Gin Cocktail with soda water, or a gin and soda instead of a gin and tonic. Again, refreshing, though not as interesting a drink as the Lommebogen version. The lack of citrus juice (or any other ingredient) definitely makes this one a pretty bland drink.